JEE Advanced Previous Question Papers: JEE Advanced Entrance Exam is one of the most reputed Entrance exams in India. Currently, there is some ongoing rift between center and IITs. All the next year events of JEE Advanced will depend on the outcome. For now, there are no major changes announced in the syllabus and Exam Pattern but as maybe we can see some changes soon. Whatever the outcome will be we have to be prepared for it, And we can do that by a complete preparation. To start your Preparation, You can go through our previous Articles such as JEE Advanced 2019 Syllabus and Exam Pattern. Where we have covered all the required information. Now in this article, we are providing Previous Year Question Paper and their answer sheet here. JEE Advanced Previous Year Papers are very helpful for the preparation. Candidates can use it to observe the level of the paper and mark distribution. Experts recommend solving these JEE Advanced Previous Year Papers. After knowing the importance of previous papers we collected them and providing to you here in the table. I also want to consider that these papers are solved paper you will find in the papers or through the extra given link. So Above we have provided JEE Advanced Papers with Solution. And now it is your turn to use them in a good way. We are also providing some useful tips to Crack JEE Advanced 2019. To crack JEE Advanced you need to do all the required handwork and study. Candidates can use available resources and stuff to start their preparation. There are many resources available online and offline which will help and guide you to achieve your goal. Some of them are JEE Advanced Model Papers, Mock test, solved papers, etc. We have provided Official JEE Advanced Papers with Solution in the above table. You can also visit the official website and participate in one of the 6 Mock Test. These mock tests are almost similar to the real exams. So it will definitely improve your speed, efficiency, and boost your Performance. 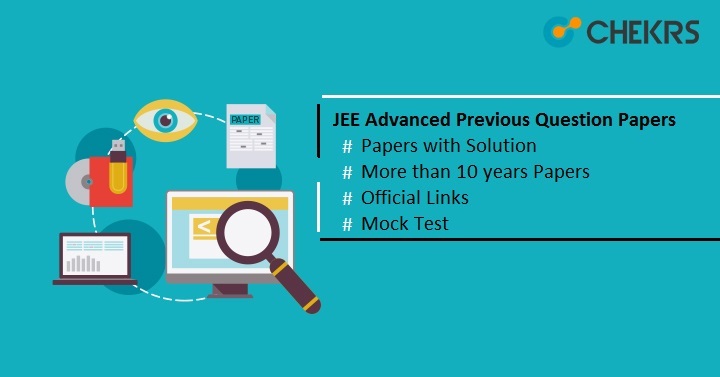 There are 6 Mock Tests provided by JEE Advanced Authority through the Official Website. Just Try one by one and check your results. Click on any of the links given below in the table. Then Click on Sign In. then Next. In next window, Choose default language and tick on the box which will be available just below it. After it click on “I am Ready to Begin”. If you face any problem you can also access some of the forums where experts will solve your problems. As I said already there are many ways to start, do and complete your preparation. You just need to be motivated and try your best. I hope our article will help you to understand the JEE Pattern and Paper Better. Make sure to cover complete syllabus and solve JEE Advanced Previous Year Question Papers. Do Well, Good luck.